Keywords: Cesarean section; successful pregnancy; unicornuate uterus; uterine anomaly. Failure of development and fusion of the Mullerian (paramesonephric) ducts result in the various uterine anomalies. These anomalies have various complications that may arise in pregnancy. 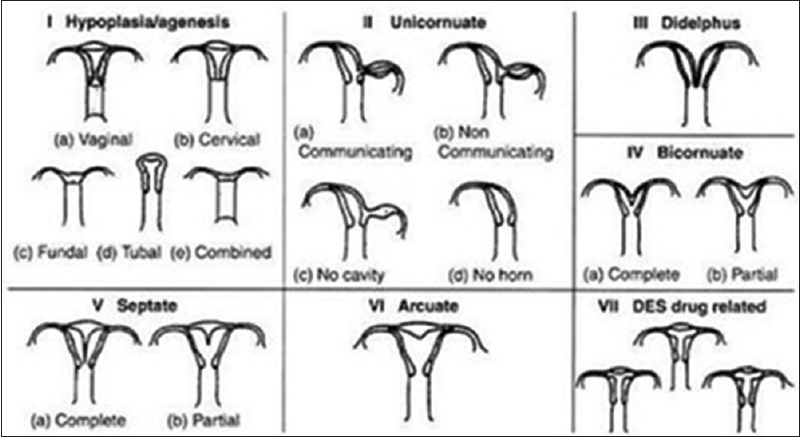 Unicornuate uterus is classified as Type II by the American Society for Reproductive Medicine Classification of uterine anomalies [Figure 1]. Further classification is made into communicating, no cavity, and no horn. In majority of cases, the rudimentary horn is noncommunicating and has a cavity. From literature, unicornuate uterus is reported to account for 2.4%–13% of all Mullerian anomalies. Pregnancy in the rudimentary horn is usually very rare and may be complicated by uterine rupture, usually toward the end of the second trimester. A 28-year-old booked G3P0 + 2 female presented with labor pains at 40 weeks and 6 days of gestational age. On examination, her general condition was satisfactory. On abdominal examination, the abdomen was enlarged with an unusual swelling in the left iliac fossa region, measuring about 10 cm × 12 cm, which had not been previously noticed during the antenatal period. She had regular uterine contractions and the fetus was in oblique lie and shoulder presentation, with regular fetal heart tones. An emergency bedside ultrasound scan made a suspicion of an ovarian cyst with abnormal lie, and she was subsequently counseled and scheduled for an emergency cesarean section and possible ovarian cystectomy. 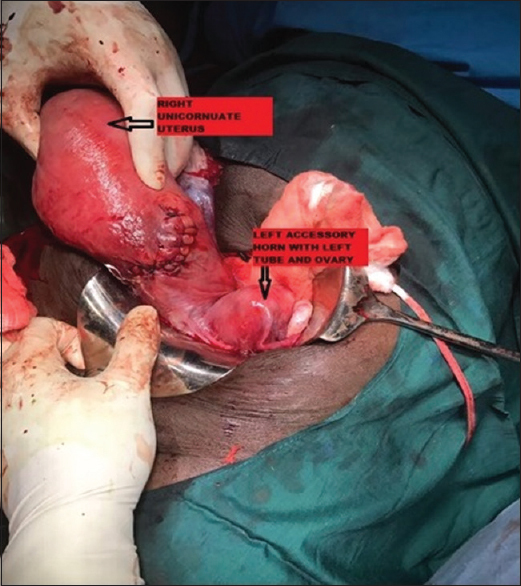 Findings at surgery revealed a right unicornuate uterus with its own Fallopian tube More Details and ovary and a well-formed lower uterine segment and accessory horn with its own tube and ovary as shown in [Figure 2] and [Figure 3]. A live female neonate weighing 3.6 kg with good APGAR scores was delivered and no other abnormality was noticed on exploration of the abdominal cavity. Estimated blood loss was 600 ml. Mother had no postsurgery complications. The diagnosis of unicornuate uterus may be missed in pregnancy, especially if the patient is asymptomatic. Even with ultrasound in the most experienced of hands, diagnosis is often not made. The woman presented had several ultrasound scans done which did not pick up the anomaly, including the scan done in labor, which revealed the mass as ovarian in origin. It may be that with contractions, the accessory horn, which was not visible initially, rotated to the left lower abdomen. This then resulted in the abnormal lie and malpresentation. The patient's antenatal period was essentially uneventful from an obstetric point of view. Pregnancy was carried to term without any incidence of abdominal pain, preterm contractions, growth restriction or uterine rupture. Forty percent of women with unicornuate uterus have renal abnormalities, which was not diagnosed in this case. A unicornuate uterus may cause an ectopic pregnancy and uterine rupture when the pregnancy is in the rudimentary horn. Therefore, it is advised to have the rudimentary horn excised if detected in the preconception period. Excision of the accessory horn could not be done in this patient because diagnosis was made at surgery, and blood loss would have been more. More so, consent had not been obtained for the procedure. The patient was counseled in the postoperative period on the findings at surgery. She was also counseled on the need to have a hysterosalpingography done and subsequently interval excision of the accessory horn. This report highlights the challenges of making a diagnosis of unicornuate uterus in pregnancy. A high index of clinical suspicion and advanced imaging is needed to make a diagnosis, to institute timely obstetric management and prevent complications to mother and baby. 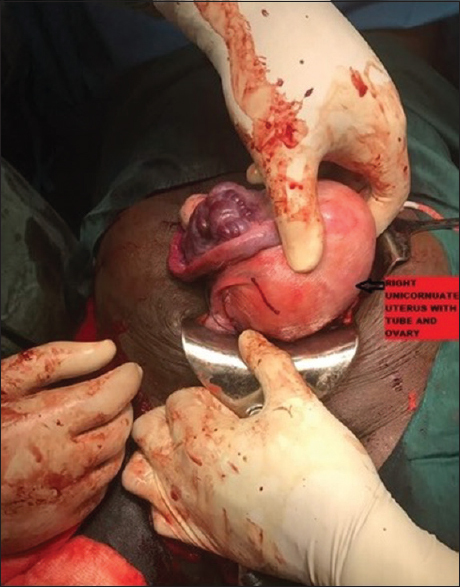 Souvizi B, Jafarzadeh Esfehani R. A case of successful pregnancy in a complete bicornuate uterus. J Midwifery Reprod Health 2016;4:720-2. Thakur S, Sood A, Sharma C. Ruptured noncommunicating rudimentary horn pregnancy at 19 weeks with previous cesarean delivery: A case report. Case Rep Obstet Gynecol 2012;2012:308476. Caserta D, Mallozzi M, Meldolesi C, Bianchi P, Moscarini M. Pregnancy in a unicornuate uterus: A case report. J Med Case Rep 2014;8:130. Rackow BW, Arici A. Reproductive performance of women with müllerian anomalies. Curr Opin Obstet Gynecol 2007;19:229-37. Fedele L, Bianchi S, Agnoli B, Tozzi L, Vignali M. Urinary tract anomalies associated with unicornuate uterus. J Urol 1996;155:847-8. Jayasinghe Y, Rane A, Stalewski H, Grover S. The presentation and early diagnosis of the rudimentary uterine horn. Obstet Gynecol 2005;105:1456-67.